Just about six months ago, I got a chance to go home. No, not to my hometown of Houma -- although, I go there all the time. 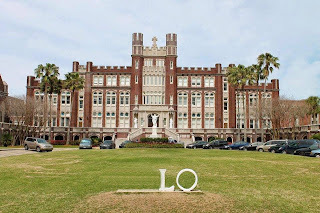 Thanks to an opportunity, a former co-worker at the former daily paper, a nice recommendation from her and a spiffed up resume, I got to go home to Loyola University New Orleans. I spent seven of the best years of my life at this beautiful, cozy, Uptown campus, beginning in 1980, when I joined a bunch of crazy women from Florida and St. Louis, Missouri, on the fourth floor at Buddig Hall. I spent the last few months living in the Cabra Hall Dormitory on the Broadway campus, just steps from where I am now working as a part time/temporary writing assistant in the Office of Public Affairs. It's a nice gig with some nice people in a nice, very quiet office in the ancient Greenville Hall, which once was part of the St. Mary's Dominican campus. I have my own little cubicle I like to call, "The Grotto." I won't get into all the reasons why it took me so long to complete my Loyola education. Let's just blame it on New Orleans, Mardi Gras, an off-campus apartment, my lack of maturity, indecision, (the now defunct) Phi Phi Phi sorority, the Oil Bust of the 80s and lots and lots of beer. Mostly the beer. But I did eventually finish. I did get a bachelor's degree in English with a minor in Religion and another in Secondary Education. But I didn't graduate. I didn't get to put on the pretty crimson cap and gown and traipse across a stage to get my diploma (or at least the cover). 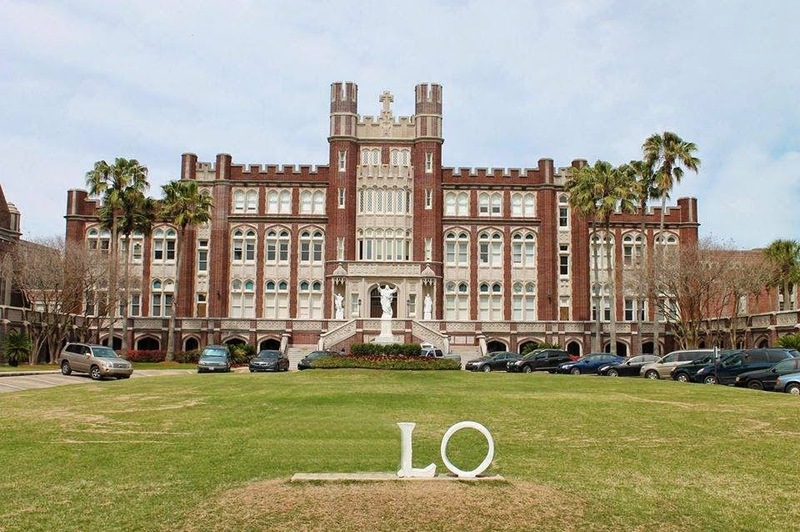 Instead, I left the Times-Picayune sports department on my lunch hour and went to Loyola to pay my final bill. The nice lady in the finance department handed me a receipt and told me to go to the Registrar's Office. There, another nice lady handed me my diploma. No cap. No gown. No "Pomp and Circumstance." No applause. Not even a cake. I had my reasons. My family was just too quirky at the time, and didn't always play nice. My high school graduation so many years earlier had been a blended family fiasco. While I sat on the Terrebonne High School football field sweating in the May heat, it broke my heart to see one part of my clan seated to my left and my dad seated to my right. They couldn't get together for just one night. for me. I didn't even want to attempt to let them try again. Plus, I was, quite frankly, a little embarrassed that it had taken me so long to finish. I dropped a lot of classes. I skipped a lot more. My transcripts are about 10 pages long. By the time I finished my last class in the summer of 1987, I was 25 years old and already working at The Times-Picayune sports department. I even spent part of my final semester living in the dorm at Cabra Hall with eight or so 19- and 20-year-olds. It was a little unsettling. And even though I was the first of our family to get a college degree, I was a joke. I still get teased about it -- or I did until my stepson beat my record. So now I'm working in the Public Affairs Office with this woman, this Cracker Jack woman, named Angela. And she is the person who puts together Loyola's graduation ceremony. I mean she really puts it together. Then she directs it. For the last several months I have heard this woman plan the annual Commencement ceremony down to the most minute detail -- from who is carrying what to who is saying what to who is ushering whom to where. It truly has been amazing to listen to her on the phone. The other day the office table was covered with "Just in Case" stuff -- markers, pens, pencils, Post-its, a first aid kit. You name it, she has thought of it. I don't know if the 1987 Commencement Ceremony was so meticulously planned. I going to guess it was not because Angela wasn't in charge then. If she had been, it would have been for sure. And it makes me rather sad that I'll never know. She makes me wish I had walked that stage. When I became a step mom to Daniel and Courtney, one of the things I wanted to make sure of was that none of their events would be spoiled by their parents because of me. And their parents agreed. Cheryl and I both are kids of divorce. We each grew up with our own stories. And it's part of the reason we all made it a priority to play nice. I've always told the kids, if they ever want Mom and Dad on the front row and me on the second, just say the word. They never have. And we don't elbow each other out of the way. We save each other seats. That's what families are supposed to do. Especially on days like this. 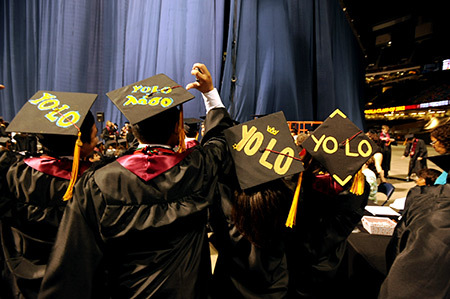 Y'all KNOW I would have wrtten "LOLO" on my cap, right?